The Sé Velha (Old Cathedral), one of the most beautiful romanic monuments in Portugal, and the Igreja de Santa Cruz (Church of the Holy Cross), founded more than 800 years ago by the first King of Portugal - King Afonso Henriques. In the same area there is also the Igreja de S. Tiago (Church of St. James) and Praça do Comércio where the charming medieval streets converge on down-town Coimbra. Climb to Almedina arch and climb on up the Quebra-Costas steps to the Manueline door of the Sub-Ripas Palace and the Torre de Anto (Anto Tower). The monumental outline of the Sé Nova (New Cathedral) stands out against the skyline and the Machado de Castro National Museum, famous for its collections of paintings, sculpture, gold work and tapestries, as well as for the elegance of its panoramic Loggia which rests on an amazing Roman crypt, the precious remains of Civita Aeminium Forum. Looking out over the River Mondego the Church of Santa Clara-a-Velha stands on the far bank, with the imposing Monastery of Santa Clara-a-Nova (Baroque, 17th Century), the final resting place of the Holy Queen Isabel, patron saint of Coimbra, celebrated in the famous religious festivities. The University of Coimbra has played a major role in the social, economic, and political life of Portugal for over 700 years. The University was officially founded on August 9, 1290 by the Bull of Papa Nicolau, IV. The University's home alternated between Coimbra and Lisbon until 1537 when King D. Joao III established it permanently in Coimbra. Although new complexes now house the Faculties of Economics, Engineering, and Medicine, the historic core of the University remains atop the city with several buildings that date to the 1700's and earlier. Today the University is a vibrant institution of 25,000 students. Entering by the Férrea gateway the visitor feels the emotion of the initiate student as well as admiration for the magnificent sequence of architectural splendour. The high-reaching, elegant tower, in its erudite baroque, stands as a symbol of the University and of the city itself. The Sala dos Capelos or Sala Grande dos Actos, form the sumptuous backdrop to the solemn academic rights held here. Capela de S. Miguel (Saint Michael's Chapel) has a welcoming atmosphere with its fine altars and baroque organ. The Via Latina recalls the procession of graduates, the opening of the school year and the investiture of the Rector. The splendid Baroque library Biblioteca Joanina (King John's Library) dazzles visitors with its gold leaf work and its amazing treasury of books of universal value. The mysterious black capes of the students can always be seen on the courtyard, the garb of students radiant with joy during the Queima das Fitas - the major academic festivity, or passionately and nostalgically grouped together during the romantic serenades of Fado de Coimbra. Children love to discover the world of Portugal dos Pequenitos (Tiny Tots Portugal) with its marvellous miniatures of monuments and typical Portuguese houses. The city has a peaceful beauty enhanced by the unforgettable view of Santa Clara. In the upper part of town, narrow streets with their patios and medieval arches, flowering window boxes, rays of sunshine and courtyards where a glimpse can be caught of the river, the Tower, the see or the bohemia of the Repúblicas, where the students bring their passions and their ideas of independence. 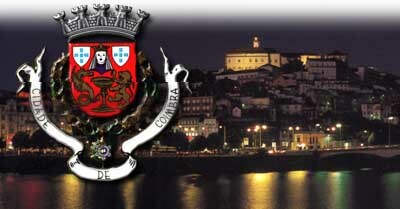 But where Upper Coimbra is dedicated to the students, Lower Coimbra is the commercial centre. Rua da Sofia and Rua Ferreira Borges are full of life and tempting shop windows. Praça do Comércio is rich in history, churches, animation, relics and inviting promenades. In the handicraft shops, or in the Anto Tower, the tourist can discover the famous Coimbra pottery, hand-painted just as it was in the 17th and 18th centuries. On the way to the Jardim Botânico (Botanical Garden), full of items of art and exotic trees, there is the monumental Jardim da Manga (Manga Garden) and beyond the graceful, romantic Jardim da Sereia (Sereia Park). Closer to town, satisfy your appetite with roast kid Mondego Valley style, chanfana, and, as a dessert, choose from the queijadas, manjares brancos, the Santa Clara pastries or the arrufadas. Outside Coimbra there are many touristic attractions - monuments from the Roman era (16 Km to south lies the roman town of Conimbriga) to the present day, mountains, spas and beaches.